The Fed is short for The Federal Reserve System. The Fed is the central banking system of the United States. The Fed has a complicated structure with 3 important institutions: the Board of Governors, the Federal Reserve Banks and the The Federal Open Market Committee. The Board of Governors has 7 members. These members are appointed by the President of the United States. The US is divided in 12 Federal Reserve Districts. Each district has it's own Reserve Bank. The FOMC is composed of the 7 members of the Board of Governors and a selection of 5 of the 12 presidents of the Federal Reserve Banks. The FOMC meets every five to eight weeks to discuss monetary policy. The FOMC is responsible for formulation of a monetary policy which has to lead to stable prices (low inflation) and economic growth. The Fed is the American counterpart of the European Central Bank (ECB). Click here for the current interest rates of a large number of central banks. The most important interest rate is the federal funds rate (Fed base rate). The federal funds rate is the interest rate at which banks lend federal funds they have with the Federal Reserve to other banks. Through a number of open market operations, the Fed can enforce the federal funds rate. Instead of really setting the federal funds rate, the Fed sets a target rate. This federal funds rate target is decided at Federal Open Market Committee (FOMC) meetings. 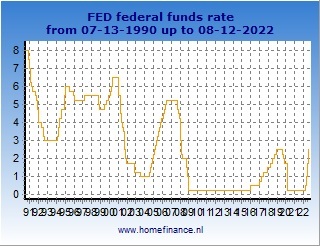 In the table and graph bellow, you can find the historical changes of the target federal funds rate.